First of all, this plant’s foliage does not really smell like anise, but more like currants. This selection is the one most often grown in the United States. Its apparent lack of a varietal name does not diminish its many valuable traits. It is distinguished from other forms by its clear green calyxes. This is perhaps the best plant for hummingbirds. Of the 40 to 50 sages that bloom in my gardens during the summer and early fall, it is the first visited by hummingbirds and the one they have the most territorial disputes over. Not only is it a long season bloomer, from one month after the last frost to the first frost of autumn, but it forms a dense colony that expands by six inches each year. It grows waist-high in most gardens. Its tuberous roots are eaten by pine voles. Much damage can be avoided by incorporating crushed rock or gravel at least 6 inches deep to deter moles, who dig the tunnels that the opportunistic voles use. Because it sends out a few mint-like rhizomes, it often survives attacks. There are forms in Europe known as `Blue Ensign’ and `Blue Enigma’. The latter may be the same form that is described above. Other forms grown in the United States include `Argentina Skies', `Costa Rican Blue Sage’, `Purple Majesty', and `Black and Blue’. This is a new form of the species introduced in the early 90s in the Philadelphia area. Its charm is the cool blue of the flowers. They have a subtle gray cast, suggesting a clear blue sky penetrated by Antarctic cold air. Although apparently hardier than the common blue form, it does not generate as many flowers. It has a typical long blooming season, and is favored by hummingbirds. Persisting better than the common form, it is not weakened as badly by competition from weeds. Forming tubers, gravel is needed to foil moles and voles. 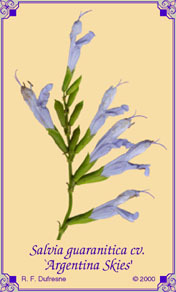 Other forms grown in the United States include Anise-scented Sage, Costa Rican Blue Sage, `Purple Majesty', and `Black and Blue’. Not everyone is satisfied that this plant is really a form of S. guaranitica. Two similar accessions were brought from nurseries in Costa Rica to the United States, one via UCLA and the other through the U.S. Plant Introduction Station in Glenn Dale, Maryland. Although not native to Costa Rica, I believe it was brought there as a gift by Argentine businessmen, then put into cultivation. It is twice as tall as the other forms, blooms later, and does not form tubers. The original literature mentions a giant form growing further north up the Rio de la Plata in a more subtropical area. I believe that this is the same species, perhaps a natural tetraploid. Under grow lights in winter, there is no apparent difference in foliage between this plant and the common form. Having almost black calyxes, it was once confused with the hardier `Black and Blue’. It is a robust plant and half-hardy for me in North Carolina. Like all fast-growing sages, it needs to be staked or grown through a tomato ring for support from winds. 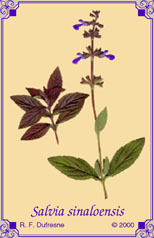 Other forms grown in the United States include `Argentina Skies', Anise-scented Sage, `Purple Majesty', and `Black and Blue’. This is a hybrid between Mexican and Brazilian sages from the Huntington Botanical Garden. While not quite as hardy as the common form of S. guaranitica, it has some of the vigor of S. gesneraeflora, getting six or more feet tall in one year. It begins to bloom at the end of summer, then puts on a magnificent show of royal purple flowers until frost, in time to nurture hummingbirds for their journey back to central Mexico, where they will continue to feed on sages. Other forms grown in the United States include `Argentina Skies', Costa Rican Blue Sage, Anise-scented Sage, and `Black and Blue’. 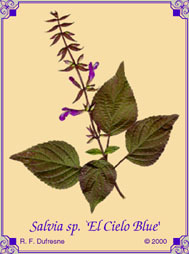 A relatively new sage, this plant was introduced to the United States by Marshal Olbricht and Lester Hawkins of Western Hills Rare Plant Nursery as a gift from the Royal Botanical Garden in Edinburgh. A relative of S. uliginosa, S. glechomaefolia, S. urticifolia, S. arizonica, and S. villosa (section Uliginosae), it shares the trait of forming a dense crown with many stems about one foot long. These bear leaves that develop a rich purplish cast in full sun that perfectly contrast the smallish azure flowers. It makes a decent container plant, as long as it is able to efficiently consume moisture. Prolonged wetness and cold is lethal to this plant during the winter. A Yucca-Do introduction from Tamaulipas, Mexico, this apparently modest sage grows on one’s fancy. It has a very pleasing architecture with handsome glossy green leaves. While the flowers are small, they are dark amethyst gems with a white marking that spills out of the throat. Blooming begins in mid-summer and persists until frost. It is presumably a known but unrecognized species.